For more than 15 years Hillside Slope Restoration has performed mitigation for landslide and failed slopes throughout Southern California. There is more than one way to repair a slope and mitigate earth movement. 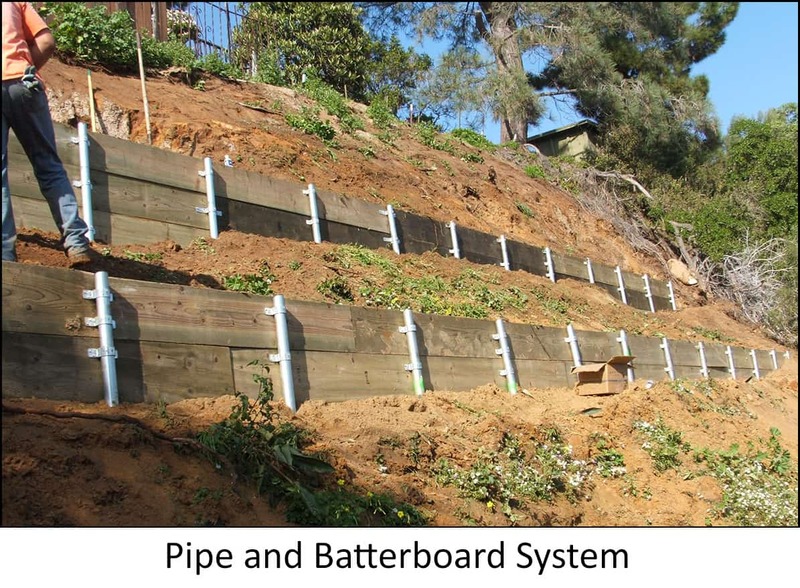 Hillside does it all…… from small backyard repairs using a pipe and batterboard system, repairing a slope using structural geogrids, construction of retaining walls or installing caissons and grade beams for larger landslide repairs… Hillside Slope Restoration is the answer. 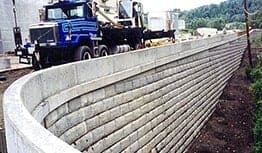 To learn more about slope failures, slope repairs and what we can do to help with your project, please click on the contact us link below and send us an email. We will respond to your email and questions promptly and/or schedule an appointment to go see your project and discuss repair options and costs. WHAT IS A SLOPE FAILURE OR LANDSLIDE? Sudden downward movement of a mass of soil from a cliff or steep slope. Landslides happen when a slope becomes unstable, usually because the base has been undercut or because materials within the mass have become overly saturated with moisture. HOW TO IDENTIFY THE SIGNS OF A SLOPE FAILURE? Is the slope eroding and sloughing off in large chunks because of the angle or height of the slope? This can affect structures nearby. Gravity will try to correct a slope angles greater than 45 degrees. Look for fresh erosion in large sections. Look at any trees on the slope. Are they growing straight or are they leaning downhill? 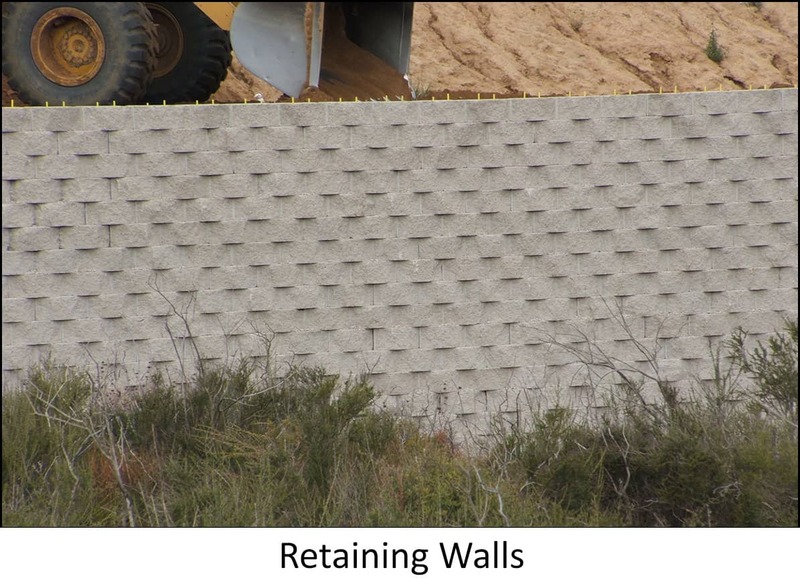 Leaning fences, walls or vegetation means there is soil movement. Look for water springs seeping out of the hillside...almost always a problem! Look for "steps" of soil down the slope. This is where chunks of earth have broken loose in the past and moved partially down the hillside and stopped. This is a dead giveaway. Usually tenskion cracks are visible and a ‘head-scarp’ is developing. Any movement of the slope will create havoc with any structures within the slide plane of the slope failure. The depth of the failure and accessibility will determine the method of stabilization and repair. Slope stability/slope performance concerns most hillside property owners. 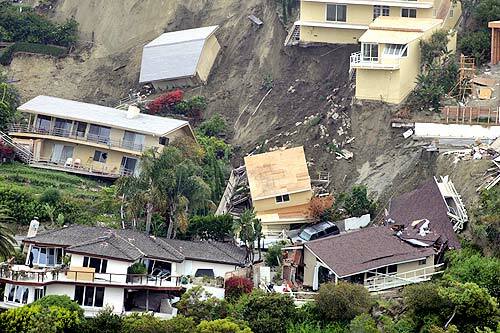 Heavy winter rains resulting in saturated earth materials can cause slope failures, landslides, and settlement. If such an event occur, the Department of Building and Safety typically issues an "Order to Comply". This may require a repair, acceptable to the Grading Division, within a specified period of time. Gravity and the lack of friction will typically reduce the gradient of most slopes; therefore, a steeper slope is more prone to instability and failures. 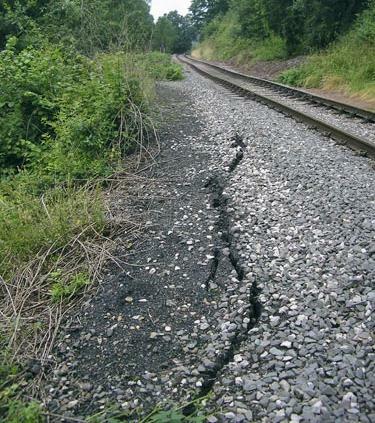 Recent erosion and/or tension cracks in the exposed soil, parallel to the contours, may be indicative of recent slope movement or may precede slope failure. Leaning trees and curved trunks indicating that the tree has tried to right itself during growth, may be indicative of a long-term soil movement process called "downhill creep." WHAT ARE THE MOST COMMON REASONS FOR FAILED SLOPES? In laymen’s terms there are really only 2 causes of a landslide. Too much water – When soil gets over-saturated it loses cohesion and becomes too heavy to support itself. With the aid of gravity the soil will slide down the hillside, usually in a continuous somewhat cohesive soil mass, leaving a scarp that is clearly visible. A seismic event – When an earthquake occurs, unstable soil becomes an easy target for failure. HOW CAN I PREVENT A LANDSLIDE ON MY PROPERTY? There are many things a property owner can do to prevent a landslide. Below are some common sense things you can do. Live in the valleys and plains with all the other people instead of on hills with nice views. If you do live on a hill make sure your foundation is carved into solid rock. Seriously though…. If you do have a steep slope make sure that standing water is not allowed to sit on top of (ponding) the slope. 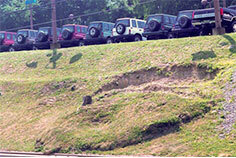 Proper drainage over slopes is a vital prevention measure and is the most cost effective way to prevent slope damage. Many of our repairs are caused by broken water lines that are undetected. In some cases this has gone on for months before the surrounding slopes begin to fail. If you see an uncommon jump in your water usage, call a leak detector out to your property to determine the cause. Make sure large trees with shallow root systems are not planted on the slope. A common mistake is to plant eucalyptus trees on slopes. They will regularly topple over in gusty winds leaving a scarp and a place for water to gather, causing further damage. Medium size trees with invasive root systems (pepper trees for example) are a better choice. Rodent infestation in some areas is unavoidable. Squirrels, gophers and moles dig holes in slopes that weaken the soil. Make every attempt to eradicate vermin from slopes. In only a few years a slope that was once firmly compacted so that water is not allowed to deeply penetrate the surface can be severely damaged by burrowing rodents. Surface planting is also vital. Avoid heavy ‘iceplant’ type plants in clayey soil. Ice plant is usually easy to grow, takes little water and fills in rapidly. However, it can be a very heavy plant for weak soils and aid in the cause of a landslide, due to the additional weight. There are better choices for slope planting that should be considered. 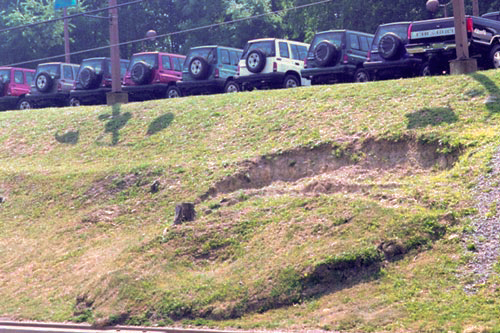 Please consult a landscape professional regarding your concerns for proper slope planting. See our slope planting page . WHEN DOES HILLSIDE GET INVOLVED? You can get us involved at any stage in the process. Have you already obtained a geotechnical or civil engineer? Let us help you with the rest of it. Do you already have a permit and you’re ready to go. Give us a call and we’ll provide a competitive quote for the construction. Is your project stuck in limbo with unresponsive engineers or city personnel? We can help. You are not sure what steps to take? WHAT STEPS DO I TAKE TO REPAIR MY SLOPE? Determine if permits are required in your particular city or county for the repair. Including what type of permit, SWPPP’s plans, required department approvals, etc. 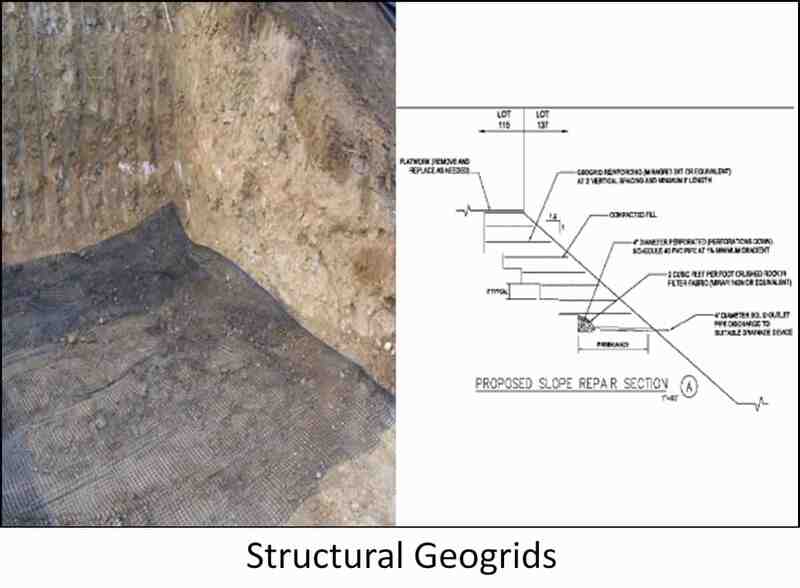 Contract with and hire a geotechnical firm that will perform a concise site specific geotechnical investigation of the causes and (working with Hillside) determine the most cost efficient repair plan. Working with our civil engineer, Hillside will provide plans and details, as specified by the geotechnical report, to meet all city requirements and approvals. 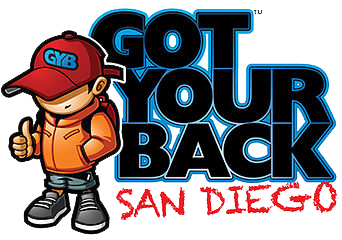 Assist in obtaining all necessary permits and construction bonds. Build the repair project for you using all of our own equipment and crews in a professional workman like manner. Please call so we can help you get this process started (760-451-8600). WHAT FACTORS INFLUENCE SLOPE STABILITY? The main force responsible for slope movement is gravity. Gravity is the force that acts everywhere on the Earth's surface, pulling everything in a direction toward the center of the Earth. On a flat surface the force of gravity acts downward. So long as the material remains on the flat surface it will not move under the force of gravity. On a slope, the force of gravity can be resolved into two components: a component acting perpendicular to the slope and a component acting tangential to the slope. The perpendicular component of gravity, gp, helps to hold the object in place on the slope. The tangential component of gravity, gt, causes a shear stress parallel to the slope that pulls the object in the down-slope direction parallel to the slope. 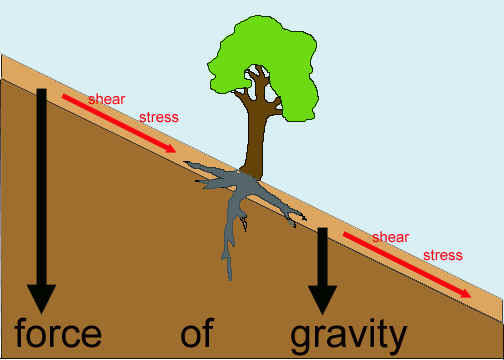 On a steeper slope, the shear stress or tangential component of gravity, gt, increases, and the perpendicular component of gravity, gp, decreases. The forces resisting movement down the slope are grouped under the term shear strength which includes frictional resistance and cohesion among the particles that make up the object. When the sheer stress becomes greater than the combination of forces holding the object on the slope, the object will move down-slope. 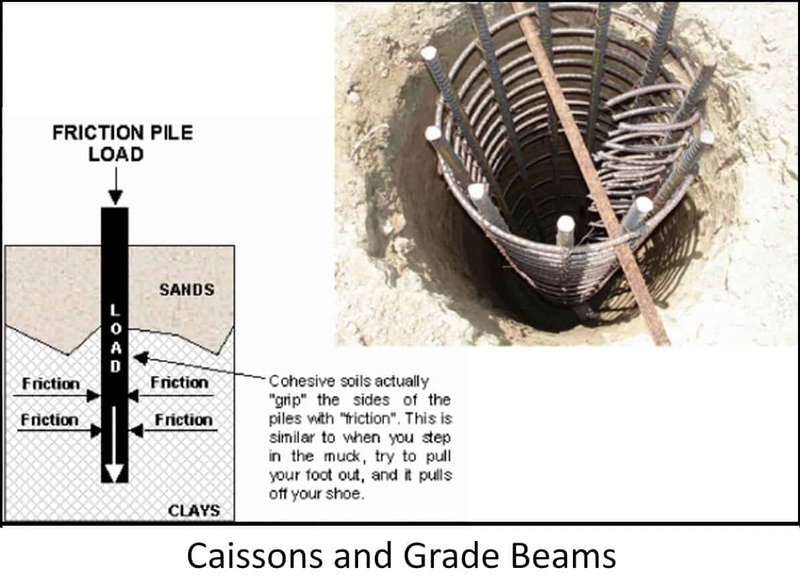 Alternatively, if the object consists of a collection of materials like soil, clay, sand, etc., if the shear stress becomes greater than the cohesional forces holding the particles together, the particles will separate and move or flow down-slope.